Games That Werent (GTW) is a project dedicated to documenting and finding lost/unreleased games which have been subject to mystery for many years across many platforms. Our aim is to get people starting up specific platform sites for their own supported system and join us in finding lost software. The success is there to be seen with the 3 supported platforms, with various big titles being found after many years in the wilderness. GTW originated from a Commodore 64 based magazine article by Ian Osbourne in the later issues of Commodore Force in 1993. 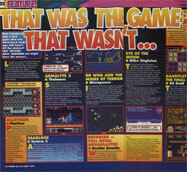 Originally entitled, “That Was the Game That Wasn’t“, the feature was of great interest and shed light on titles which people never knew even existed. Often it was thought how these games would be like to actually play. Research through many hundreds of old magazines started to uncover even more unreleased / imcomplete games, and eventually the information evolved into a regular feature for the now sadly deceased Commodore Zone magazine, called “Games That Werent“. Popularity of the feature from its readers pushed the demand for a web site to detail more about other unreleased games on the Commodore 64. After a successful year, the sites interest grew, games began to be found, thanks to the wonders of the Internet and email, and information about various games grew. Eventually an archive was established to download these lost / unfinished games, and GTW essentially started to became an archiving project in its own right. Since the success of GTW64 (The C64 version of Games That Werent) we have tried to push other gaming communities to set up their own GTW project for platforms such as the SNES, Spectrum, Amstrad, Amiga etc. and to find unreleased/lost titles on their respective platforms. 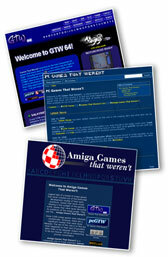 As a result, GTW64 has been joined by PCGTW for the PC platform, and aGTW for the Amiga platform already both projects are making some very interesting discoveries! One thing weve been missing is a main site to encapsulate us all and report news, features and discussions on a variety of lost/unreleased games across a variety of platforms. The main gamesthatwerent.com site aims to bridge the gap, and also allow you to go off into one of our mirror sites for a specific machine if you wish. We will report all our site update news in one place, produce features and news items on any big finds across all platforms and by other unreleased game sites. So if Mire Mare turns up well let you know! We hope our list of specific GTW project mirrors will grow in the future, but we need your help! We are trying to encourage communities to join with us and set up their own GTW mirror site for their own platforms. Its a worthwhile project, and one which can reap many rewards. Wed love to cover all the systems ourselves, but there are just too many games to cover for only one system, let alone hundreds of them! Want to join us with your own GTW project? then get in touch! All the hard work and searching cannot be done alone An essential part of the success of the project is YOU!. Being a large group of fanatics who know your stuff, your help is essential to us trying to find games which have gone by the wayside. If its just credits, infomation or even the game itself, contributions from the scene have been immense so far for our GTW projects. Possibly you are a developer who worked on a piece of software that never quite made it on a particular platform that we cover. If so, then please email us! Even if its long lost, or just a sprite.. well write a review about it and preserve it forever. If we dont cover the platform, maybe you would like to submit a feature on your unreleased game for us to publish at www.gamesthatwerent.com? We are open to feature submissions for all platforms! To Timo for the original hosting, Mort for the scans of the original feature, The GTW team for all their work, the entire team for all their hard work and Vinny Mainolfi for his dedication and support and everyone else for helping out! !